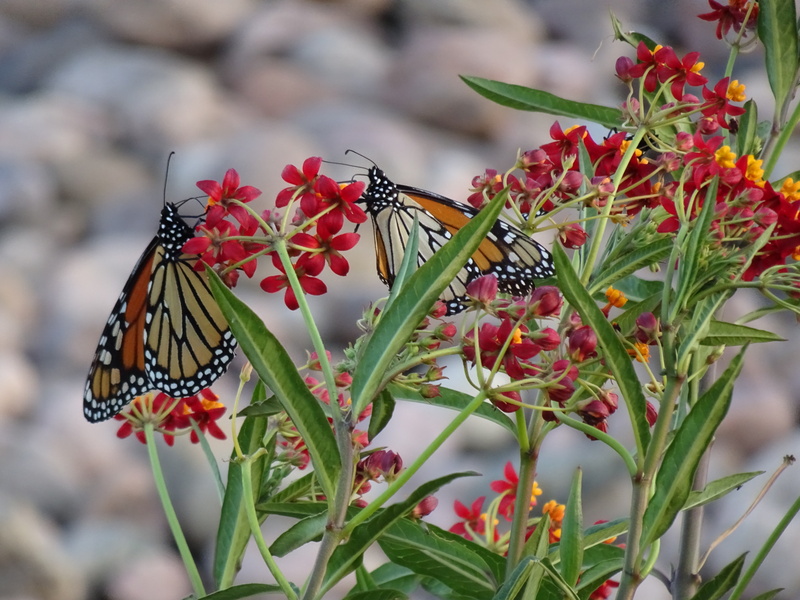 Monarchs stopped by today on their way to over-winter in Mexico. 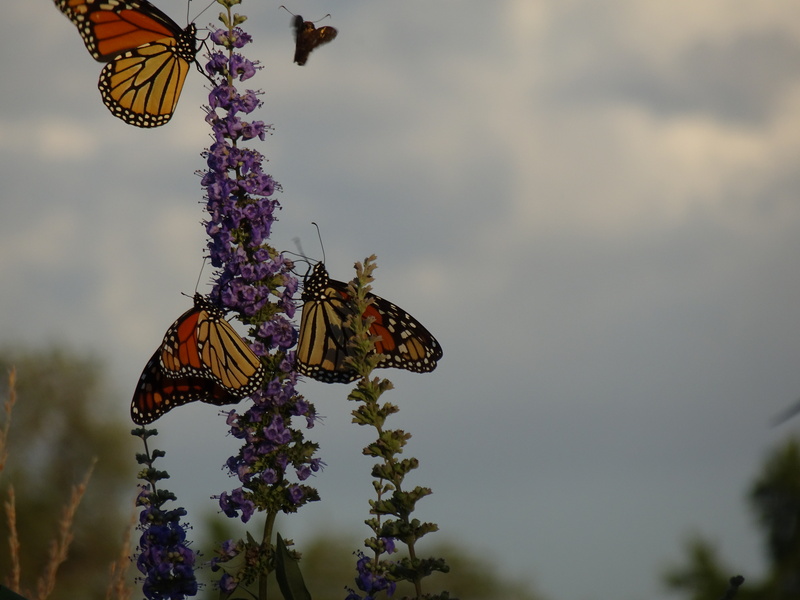 Each spring and summer there are 3 – 5 generations born. Most of them live 5 weeks, with the exception of the last generation born at the end of summer. They make the journey back to Mexico. They will then return the following spring. 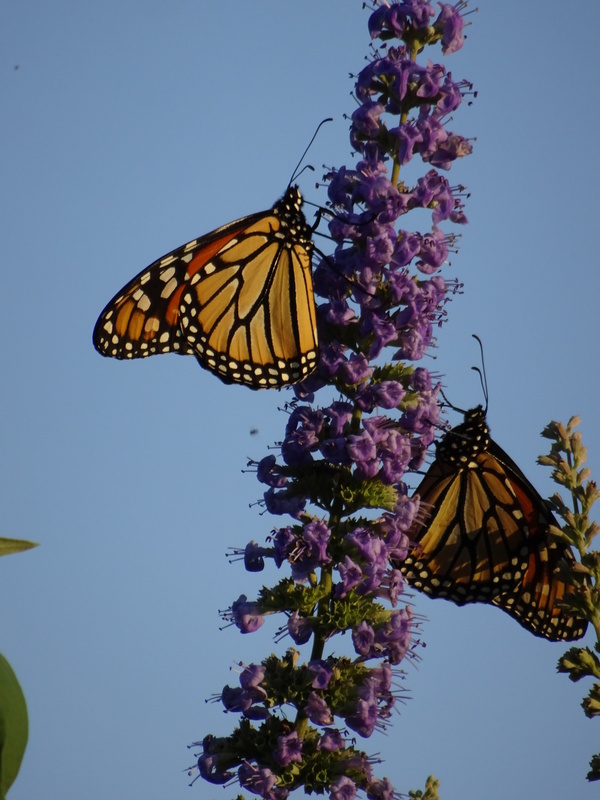 Over-wintering monarchs can live to be 8 months old. 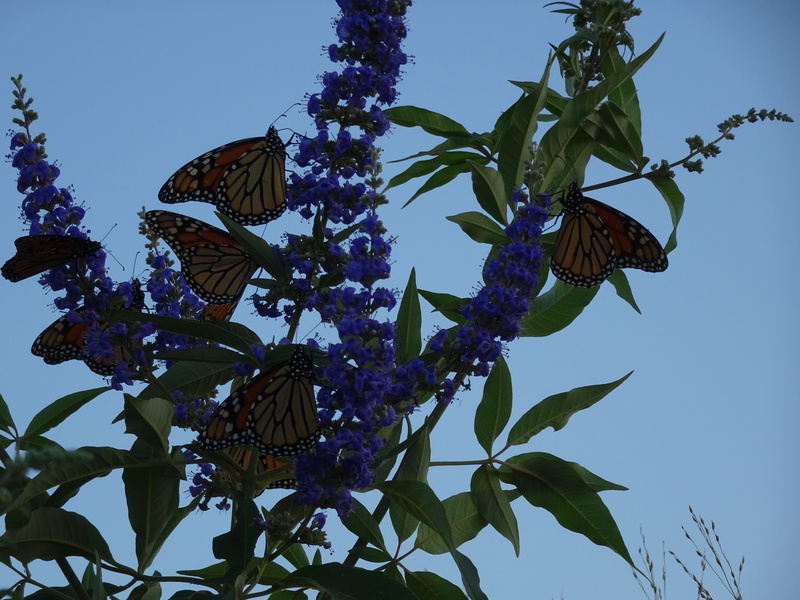 The monarchs were feeding on the butterfly milkweed and vitex (Chaste tree). 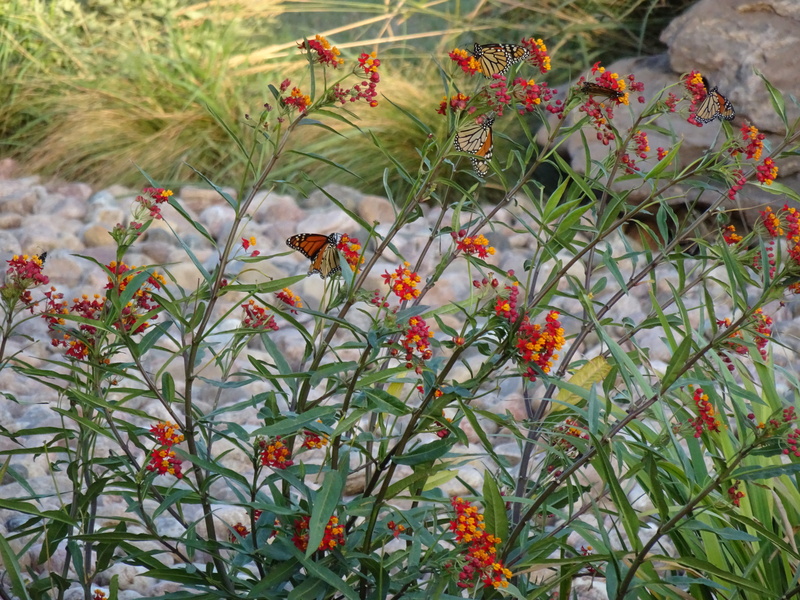 We are also in the process of adding a larger area of plants focusing on plants that attract butterflies. 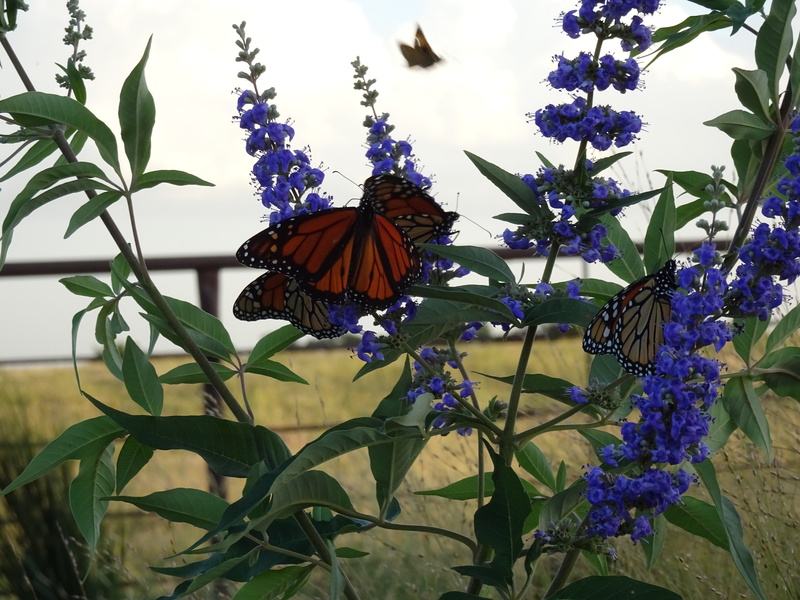 This entry was posted in On The Farm and tagged butterflies, flowers, Kansas on September 17, 2015 by Debra Farmer. 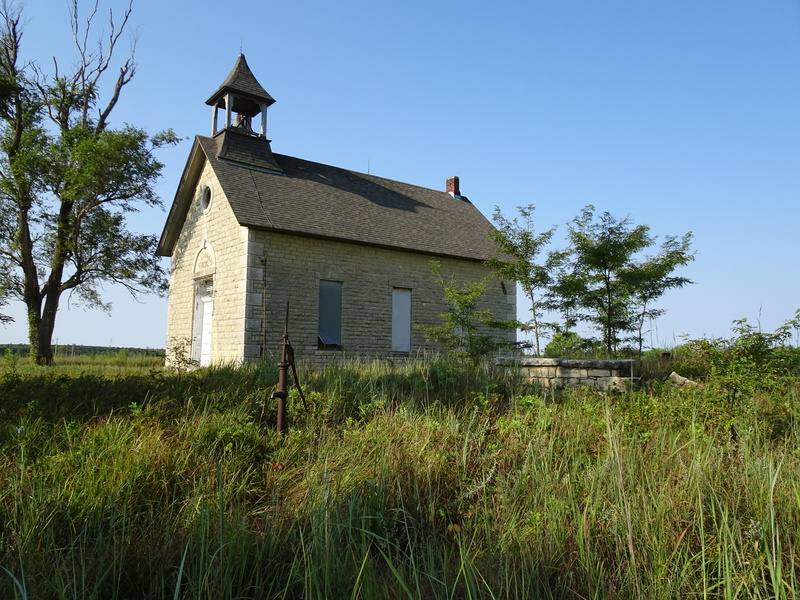 There was a time in Kansas history, when a one room school house was built in almost every township, approximately 3 miles apart. 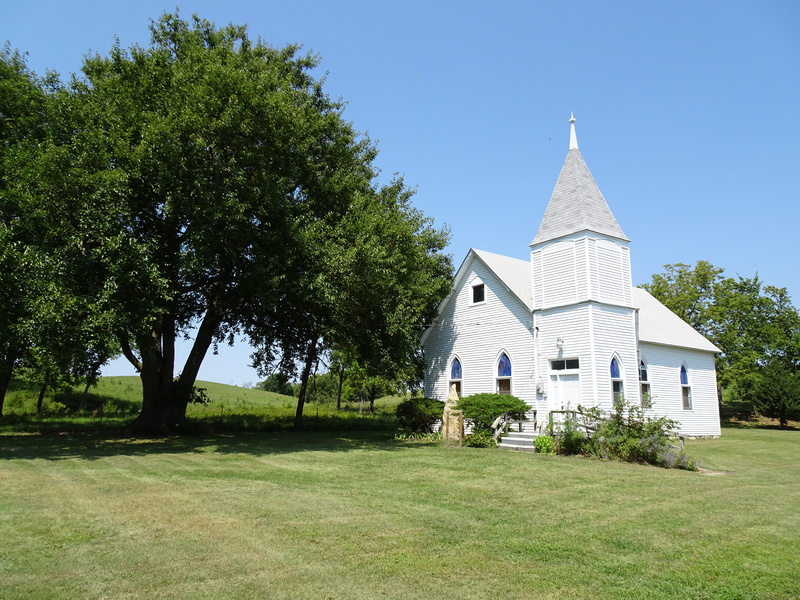 They stood on an acre of ground donated by a farmer and built with public funds. 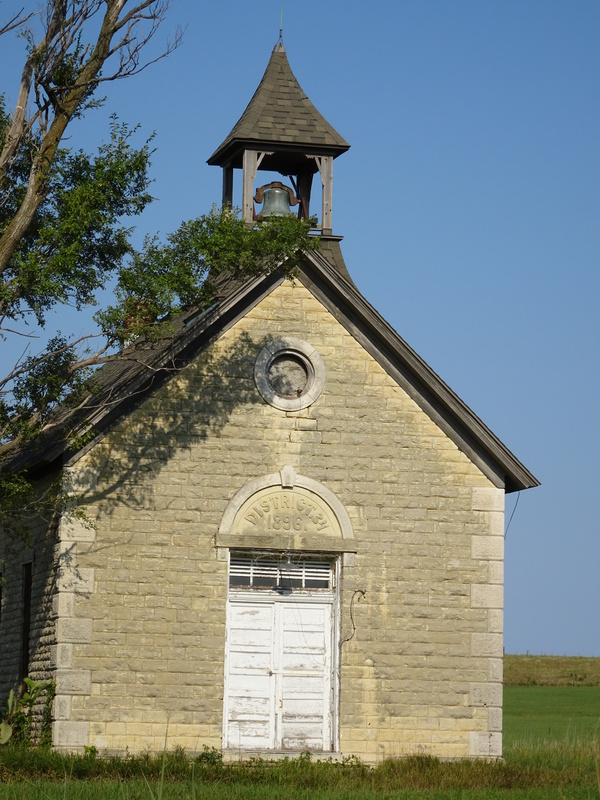 Low enrollment and consolidation forced the closing of Kansas’ one room school houses in the 1950’s and 60’s. 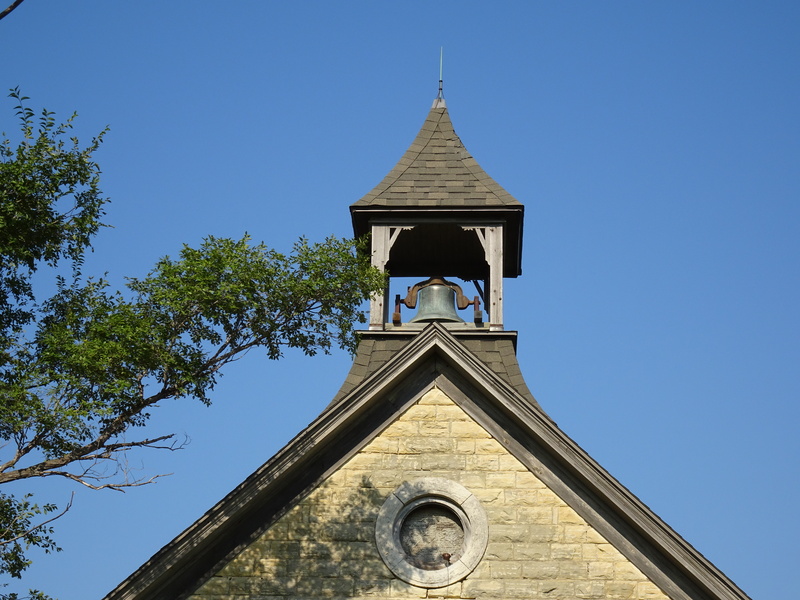 The Bichet School District 34 was built in 1896. 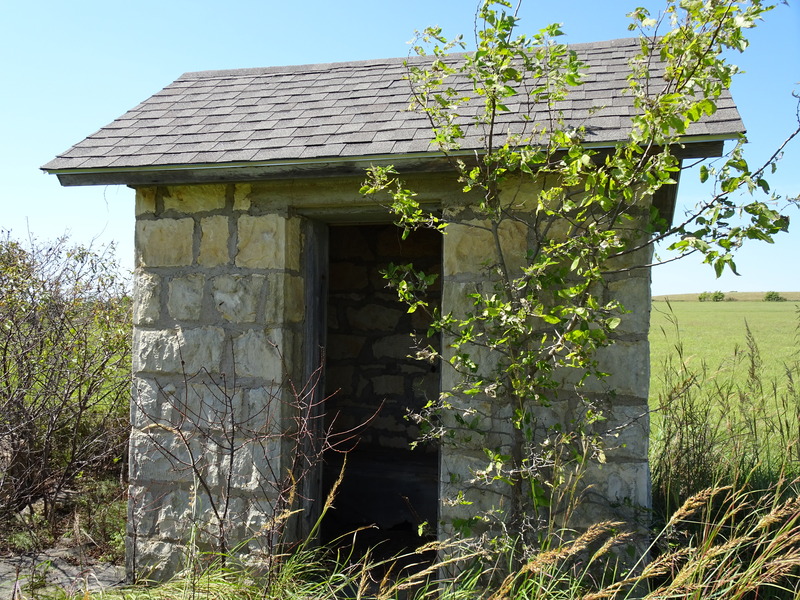 Along with the one room school house, are two outhouses and a stone cave, all constructed of native limestone. 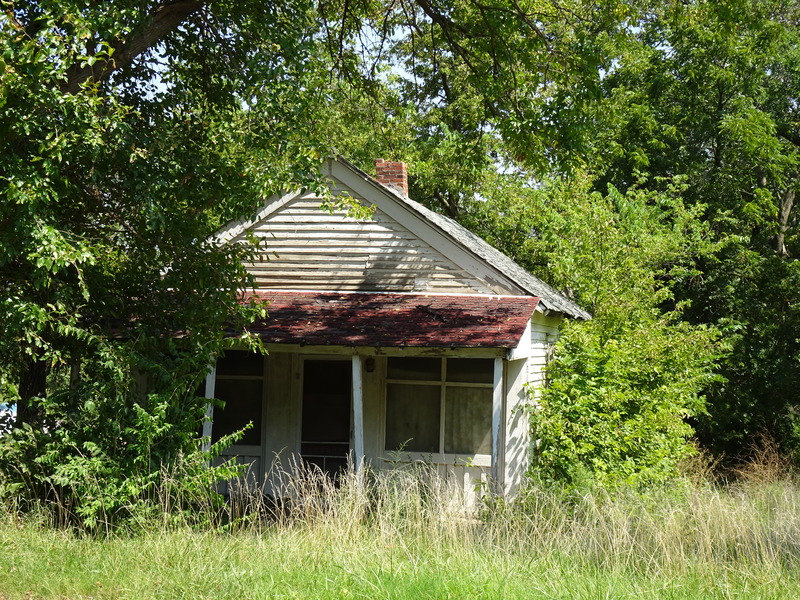 Two students were attending the Bichet School when it closed in 1946. 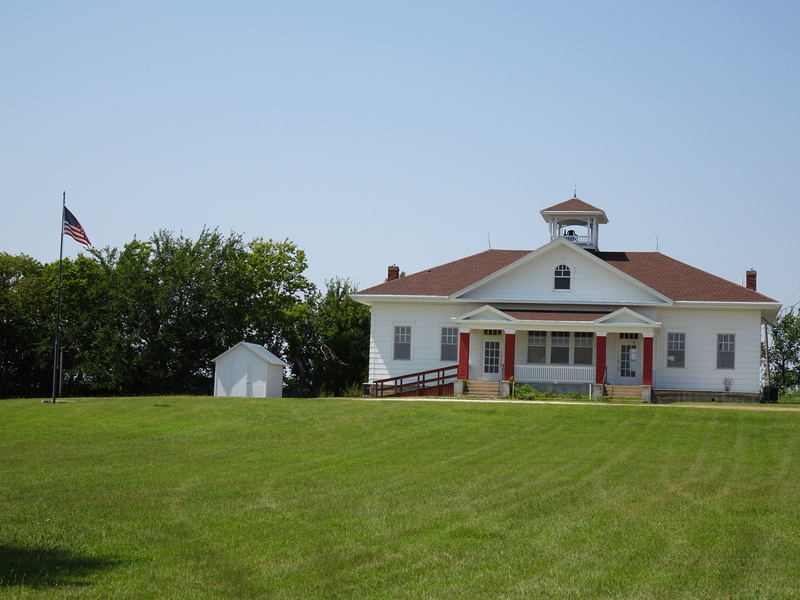 The school served the French settlement 4 miles east of Florence, KS. 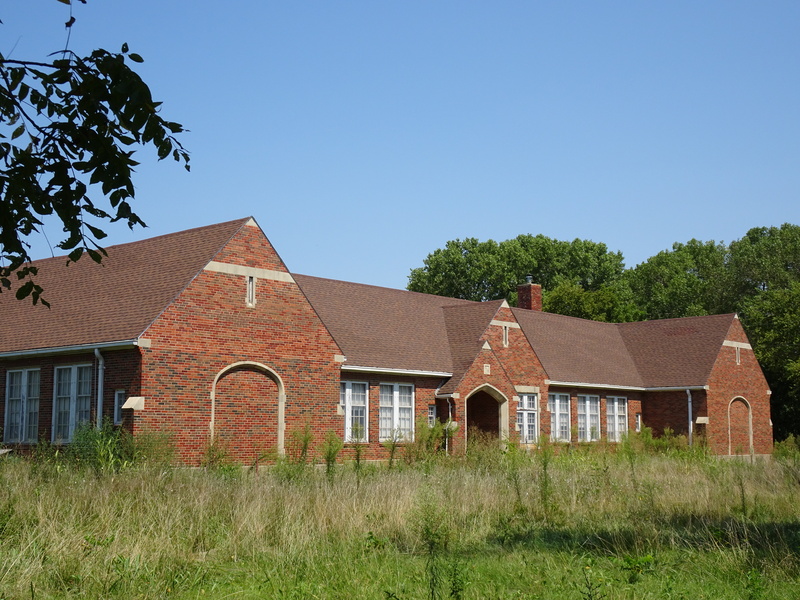 The Bichet School District 34 is listed on the National Register of Historic Places. 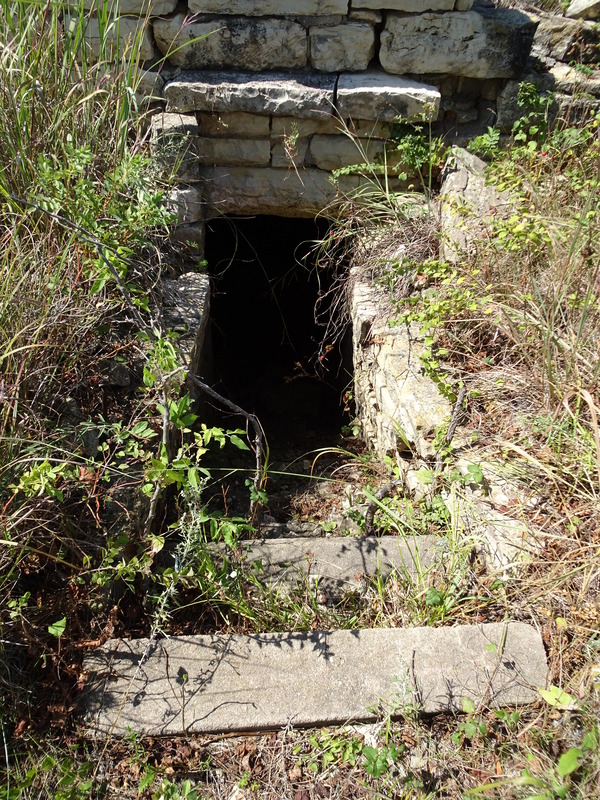 This entry was posted in Day Trips and tagged CAVES, Flint Hills, Kansas, Schools on September 14, 2015 by Debra Farmer. 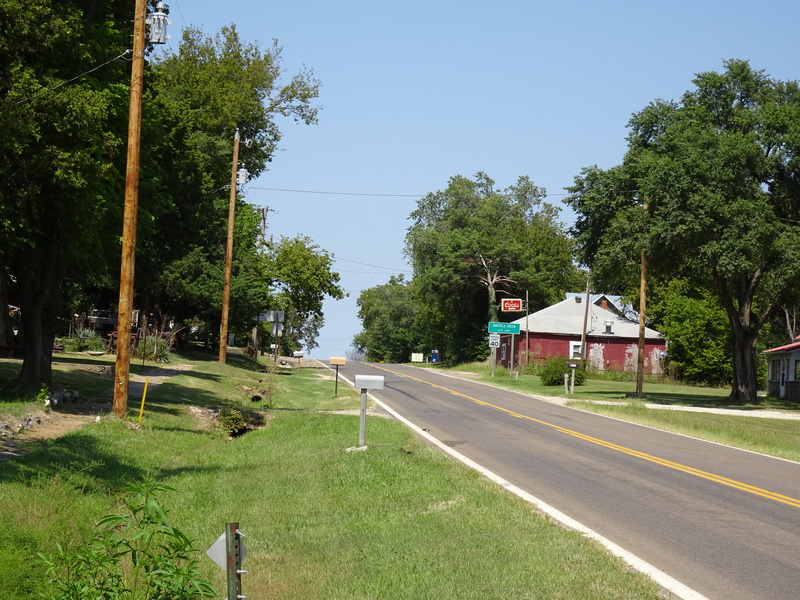 A post office was established April 1860 at Bazaar, Kansas, in July of 1876 the post office was renamed Mary (in honor of the postmaster’s wife) then changed back to Bazaar 2 years later. On March 31, 1931 TWA Flight 599 crashed southwest of town, killing all 8 on board, including Notre Dame football coach Knute Rockne. There is a memorial along the Kansas Turnpike and also at the crash site, which is on private land. With the arrival of the railroad, Bazaar became a major shipping point for cattle. The school that as built along what is now Highway 177 closed when it consolidated with Cottonwood Falls, and it now serves as a community center. 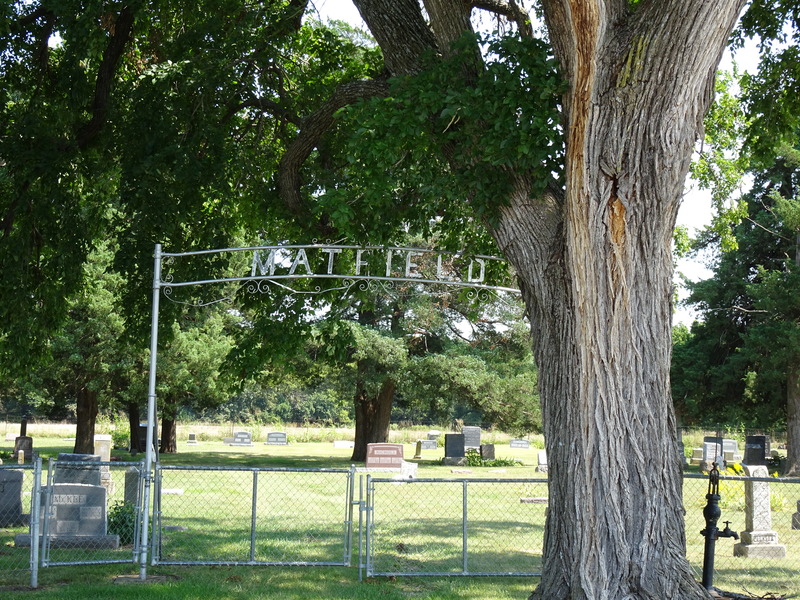 Matfield Green, KS is named after Matfield, England. A post office was established here in 1867 it closed in 1995. Around the turn of the 19th century this was a town of 350 residents. There was a bank, grocery store, livery and blacksmith, hardware store, flour mill, lumber yard, hotel and schools. 2010 census is 47. 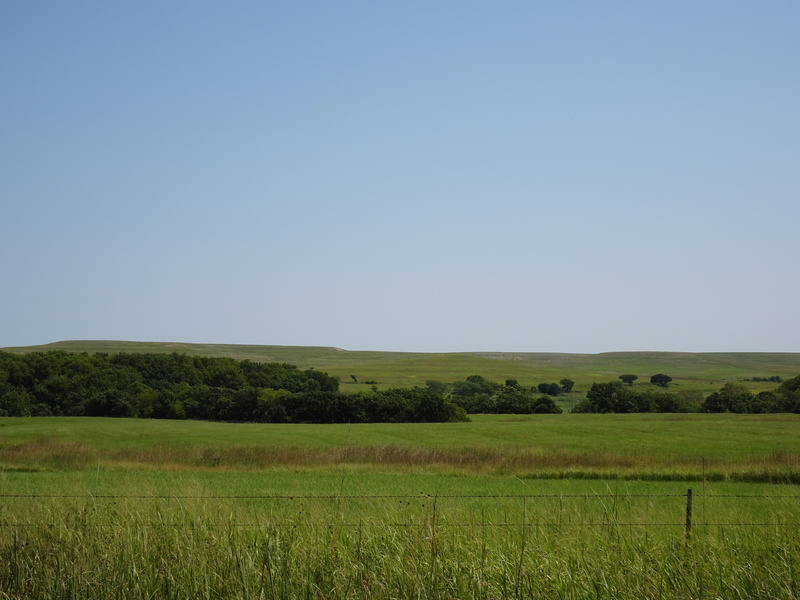 Matfield Green is located in the beautiful Flints Hills and there are 2 ranches nearby on the Nation Register of Historical Places, the Crocker Ranch and Pioneer Bluffs Ranch. 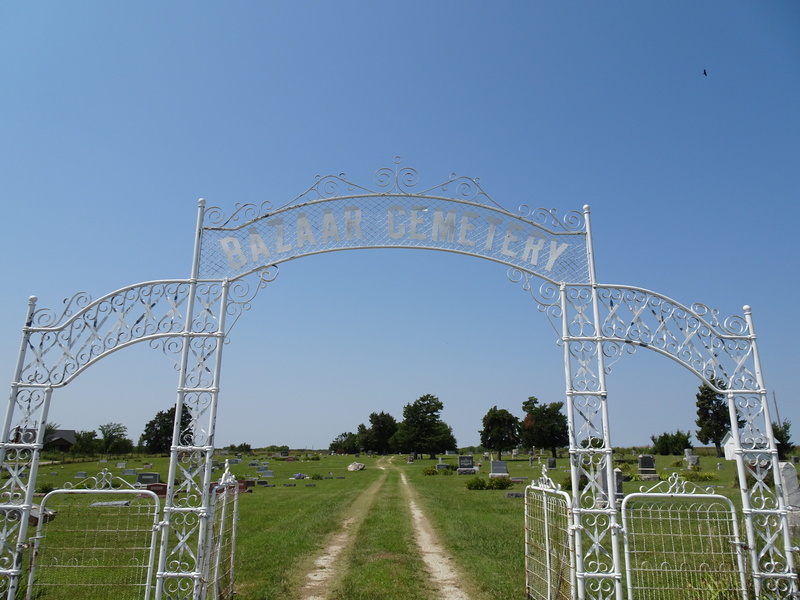 This entry was posted in Day Trips and tagged Flint Hills, Ghost Towns, Kansas, Schools, small towns on September 6, 2015 by Debra Farmer. After a hot and WINDY day, we are blessed with a beautiful sunset. 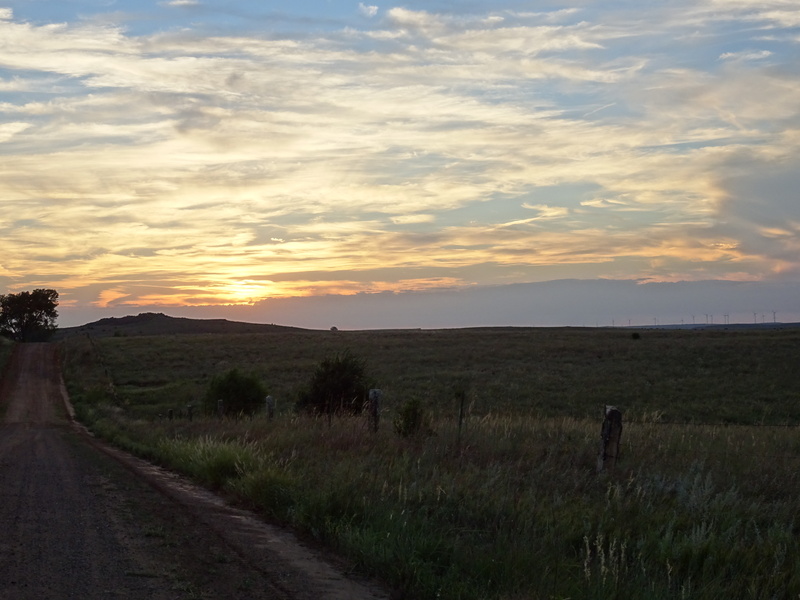 This entry was posted in On The Farm and tagged Kansas, Sunset on September 5, 2015 by Debra Farmer. Donna (my sister-in-law) and I had a project to do and we decided to meet in Cottonwood Falls, KS. 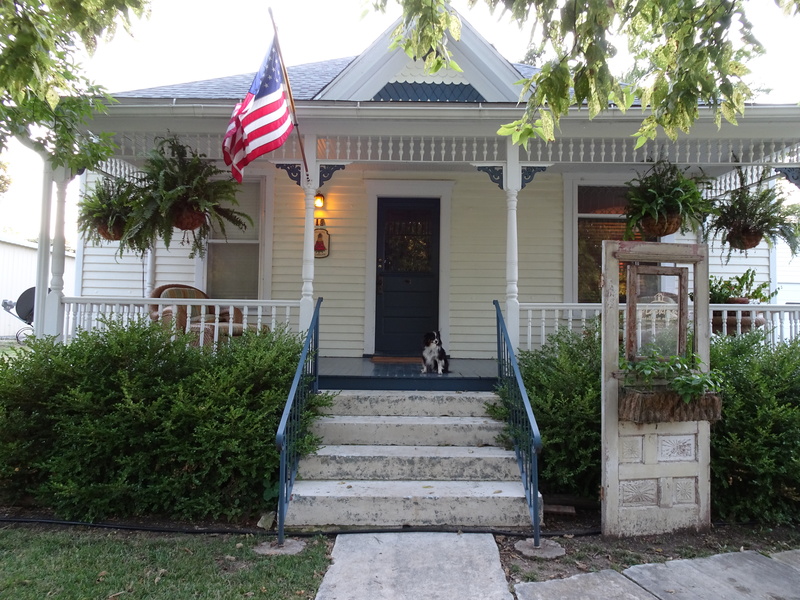 We were able to complete our task in this wonderful home that was located 2 houses away from the historic courthouse. Kris and Pat Larkin who operate the Lark Inn have numerous homes around Cottonwood Falls and Strong City. Wylie and my two nights stay at the Lark Inn on Elm was so enjoyable and we loved having Donna with us for the day. Be sure to visit the Lark Inn website and pick your favorite home and book it. 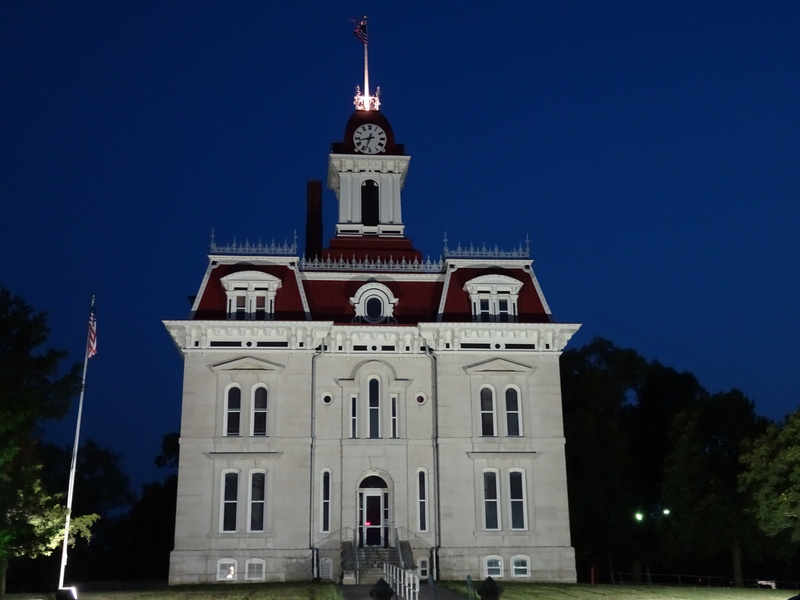 You will enjoy the time spent in the beautiful Flint Hills, Tallgrass Prairie National Preserve, shopping and dining in Cottonwood Falls and of course your stay at the Lark Inn, where they make you feel so welcome. I plan on going again!! 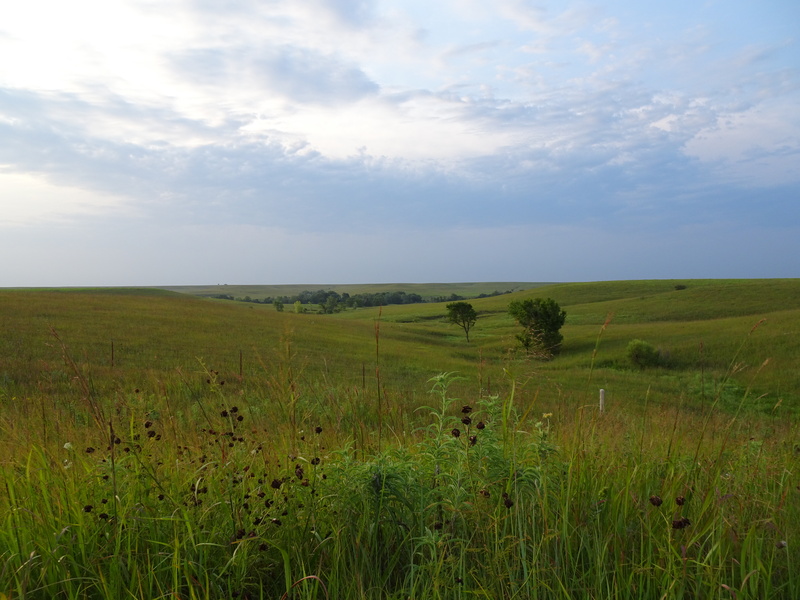 Tallgrass prairie once covered 170 million acres of North America, today only 4% remains, mostly here in the Flint Hills of Kansas. 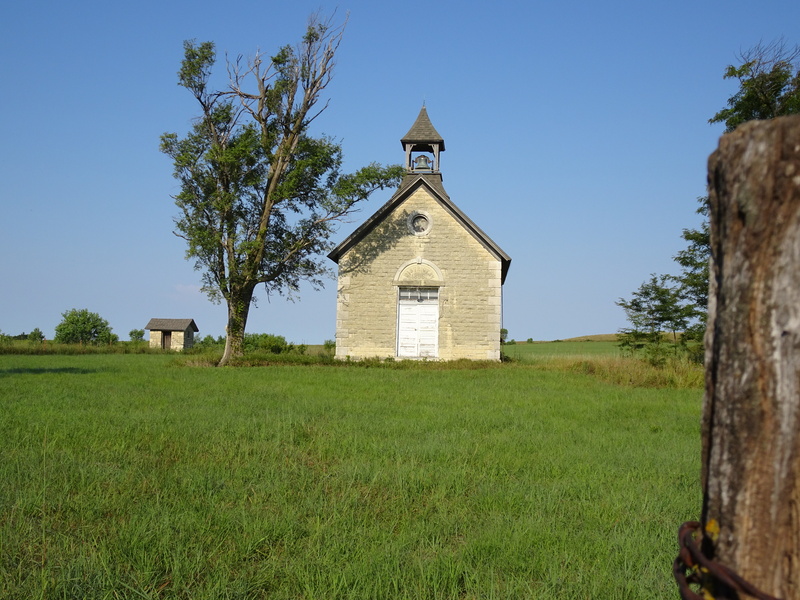 This entry was posted in Day Trips and tagged Flint Hills, Over Night Stay, Pastures, small towns on September 1, 2015 by Debra Farmer.